https://austin.bintheredumpthatusa.com/pricing	Bin There Dump That Austin	https://austin.bintheredumpthatusa.com/img/franchisees/7.jpg	1413 O'Reilly Court, Austin, TX	Contact us for more details. 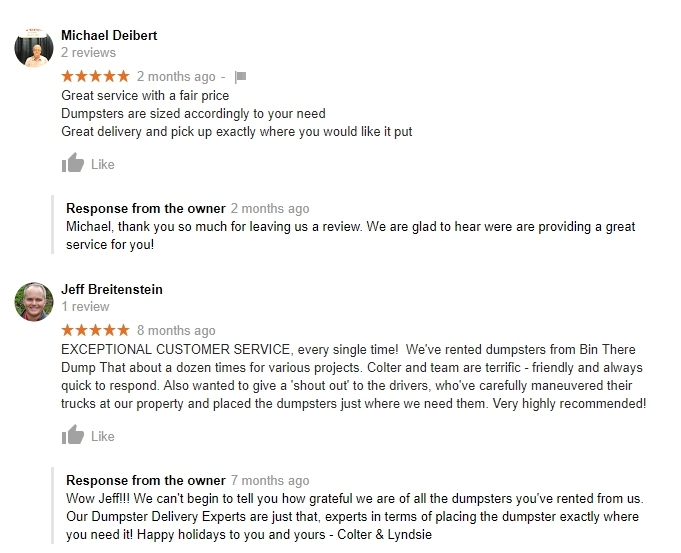 You should know that renting a dumpster from Bin There Dump That is very affordable considering you'll receive Austin's only residential-friendly dumpster rental service. Bin There Dump That commits to providing you a simple, reliable and enjoyable experience in your waste removal project, which means we'll always answer our phones, we'll protect your driveway and even sweep up remaining debris when we come to pick up the bin.